TOPIC: Is there a way to lock FPS with Reshade? Is there any way to lock fps? Besides using msi after burner / rivatuner. Last Edit: 4 years 2 months ago by crazyturtle. I know a fair amount of people on the sweetfx support thread on guru REALLY want a frame limiting feature, myself included! - set your locked fps next to "Framerate Limit"
- click top tab "Monitoring"
- click check box "Show in On-Screen Display"
- click top tab "On-Screen Display"
RadeonPRO also works with Reshade, if you have an AMD card. 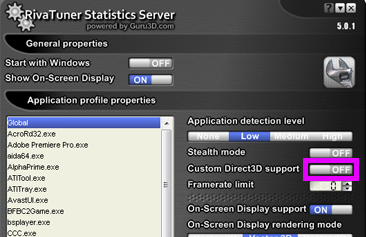 If you are a NVIDIA user, you can also use NVIDIA Inspector to lock framerate. Was never able to get the framerate limiter to work with reshade, could just be me. Though it worked fine for games without any sort of injection.